Pre-heat oven to 190C/375F/gas 5. Peel, core and slice apples. Place in a saucepan with the water, lemon rind, lemon juice and sugar. Cook until softened. Cool slightly and add the breadcrumbs. Meanwhile blend the butter with the cinnamon and use to spread bread slices on both sides. 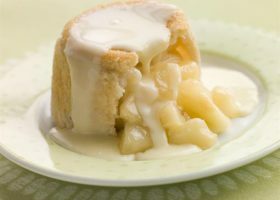 Use approximately three quarters of the buttered slices, cut into rectangles to line a 600ml (1pt) pudding basin, overlapping the slices to ensure there are no gaps. Fill the lined basin with the apple mixture and cover with the remaining bread. Bake for about 40 mins. When cooked leave for a few minutes before turning out and serve with crème fraiche or custard.